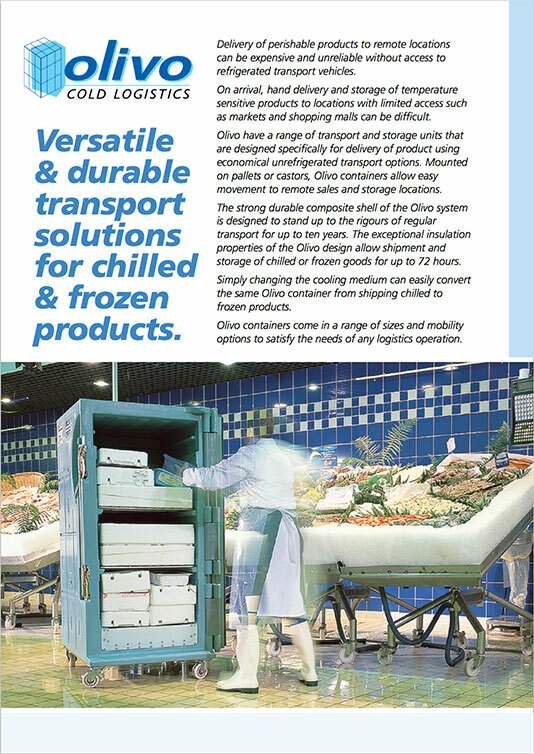 Deliver Chilled, Frozen and Dry Goods in one truck… Now that’s smart! to simplify your fleet management by eliminating the need for refrigerated transport. Swapping eutectic plates for dry ice to transport chilled goods one day and frozen goods the next. Mixing and matching modules to achieve multiple temperature zones in the one vehicle. Load goods at shift-end, store overnight, deliver next morning. Wheel your Olivo insulated container to and from your packing area. Improve delivery van effectiveness. Make your vans capable of carrying a wide variety of refrigerated and frozen goods to smaller delivery points. Maintain the integrity of Cold Chain goods while in transition areas. Transport frozen goods in refrigerated vehicles. Segregate meats for HACCP food safety regulation and religious reasons. CO2 neutral when eutectic plates are cooled using green power. made of polurethane enveloped in polyethylene. The urethane insulates and the polyethylene provides a clean hygienic barrier that protects the urethane. Cooled by eutectic plates or Dry-Ice. Performance exceeds ATP (Agreement Transports Périssables) regulations.